KIEV, Ukraine -- The campers, some clad in combat fatigues, carefully aim their assault rifles. Their instructor offers advice: Don't think of your target as a human being. So when these boys and girls shoot, they will shoot to kill. Most are in their teens, but some are as young as 8 years old. They are at a summer camp created by one of Ukraine's radical nationalist groups, hidden in a forest in the west of the country, that was visited by The Associated Press. The camp has two purposes: to train children to defend their country from Russians and their sympathizers - and to spread nationalist ideology. "We never aim guns at people," instructor Yuri "Chornota" Cherkashin tells them. "But we don't count separatists, little green men, occupiers from Moscow, as people. So we can and should aim at them." The nationalists have been accused of violence and racism, but they have played a central, volunteer role in Ukraine's conflict with Russia - and they have maintained links with the government. Earlier this year, the Ministry of Youth and Sports earmarked 4 million hryvnias (about $150,000) to fund some of the youth camps among the dozens built by the nationalists. The purpose, according to the ministry, is "national patriotic education." Ministry spokeswoman Natalia Vernigora said the money is distributed by a panel which looks for "signs of xenophobia and discrimination, it doesn't analyze activities of specific groups." 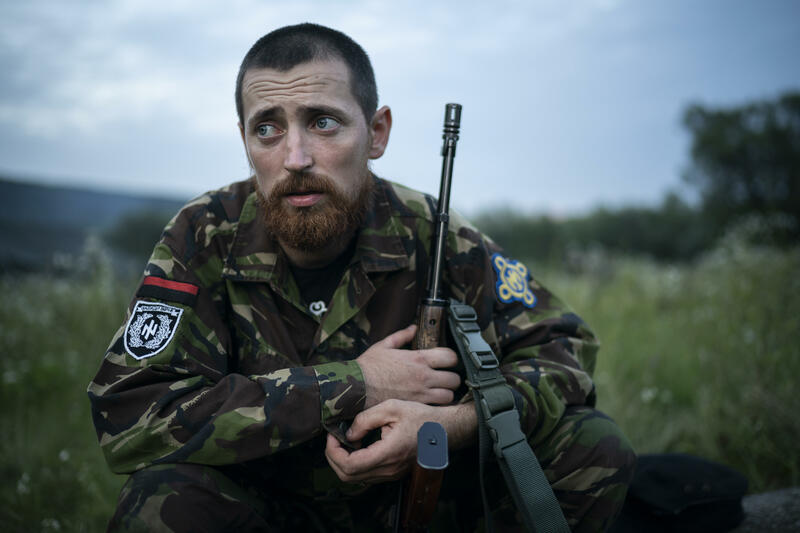 Cherkashin is a veteran of the fight against pro-Russia separatists in eastern Ukraine; he was wounded in combat and later came to lead Sokil, or Falcon, the youth wing of the Svoboda party. It is important, he says, to inculcate the nation's youth with nationalist thought, so they can battle Vladimir Putin's Russia as well as "challenges that could completely destroy" European civilization. "You need to be aware of all that," said instructor Ruslan Andreiko. "All those gender things, all those perversions of modern Bolsheviks who have come to power in Europe and now try to make all those LGBT things like gay pride parades part of the education system." While some youths dozed off during lectures, others paid attention. Clearly, some were receptive. During a break in training, a teenager played a nationalist march on his guitar. It was decorated with a sticker showing white bombs hitting a mosque, under the motto, "White Europe is Our Goal." Aside from the lectures - and songs around the campfire - life for the several dozen youths at the Svoboda camp was hard. Campers were awakened in the middle of the night with a blast from a stun grenade. Stumbling out of their tents, soldiers in training struggled to hold AK-47s that were, in some cases, almost as tall as they were. They were required to carry the heavy rifles all day, and one of the girls broke down in tears from exhaustion. At 18, Mykhailo was the oldest of the campers. The training, he said, was necessary. "Every moment things can go wrong in our country. And one has to be ready for it," he said. "That's why I came to this camp. To study how to protect myself and my loved ones"